J ust like humans, pets need daily physical activity to keep fit. Unlike people, however, pets don’t have jobs, families, and commitments that can keep them busy all day long. So how does the concerned pet owner make time for Fido fitness? Thankfully, there are multiple workouts with a variety of commitment levels for owners. Here are some exercises that owners can setup for their puppies (and, in some cases, kitties as well). Follow Fido: Everyone knows that dogs like walks, but usually it’s the owner guiding the journey – try it the other way! Let your dog lead and go where they want to go, stop where they want to stop, and let them have a turn being in charge. 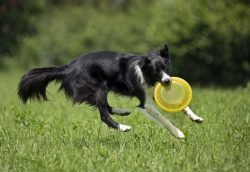 Play with Friends: Setup some socialization activities for your pooch. Time with their peers can allow dogs to burn off energy and learn new games that will keep burning calories. Searching for Scents: Does your dog have a favorite treat? Try this: let the dog smell their favorite treat and then hide it, either somewhere around the room or in one of a series of boxes. Let your dog find the treat using their nose. Even a little movement around the house can get the heart rate up. Stairs: If you live near a place that has access to stairs, try moving up and down them with your dog. It’s a great way for both pet and owner to stay in shape (but if this is a new activity for you, consult your physician before trying it yourself). Make an Obstacle Course: If you have a few boxes or pipes around the house, try building your own obstacle course! Switching it up every time you play will allow you to be creative and keep your dog on their toes (or paws). Treadmill: Allow your dog to get comfortable with the treadmill. Be sure to start off at a very slow speed without an incline. Once your pet gets used to this exercise, you can gradually increase the speed. Never tie the leash to anything that could harm your dog if they stop walking (like the treadmill). Reward and motivate your dog at milestone times with lots of hugs and treats. Tug of War: This is a classic and requires little to no effort on your part, depending on the size of your dog. All you need is a rope and an enthusiastic voice to get your dog ready to play. Swimming: Have a pool that your pooch can enjoy? Take them! Many dogs love to swim, especially when it’s hot out. This is a great way for dogs to get some low-impact physical activity. Always monitor your dog in the pool and have a life jacket handy in case your pup needs extra buoyancy. Also, don’t forget to show your dog where the stairs are so they know how to exit the pool without panicking. Fetch: There’s a reason humans have been playing this game with their companion animals for years: it works. Dogs love to chase things and humans know how to throw – it’s a match made in heaven. There are even devices on the market that can help you throw with a little extra oomph. Keep it regular. Making these activities a ritual will help you and your pet to stay on track. This can allow your dog to help motivate you, and vice versa. Don’t overdo it, especially at the beginning. Working out should be fun, but it’s still a physical activity, and a new one at that. Keep an eye on your pet to ensure they don’t go too hard too fast. Ensure that your puppy drinks lots of water to avoid dehydration. Even dogs can forget to stay hydrated when they’re having too much fun. If you’re planning on taking your pooch to a place where they’ll be walking or running on blacktop or other rough terrain, consider getting them some dog shoes to avoid hurting their paws. Time influences dogs as it does humans. While your canine may be enthusiastic about their new routine, it may be too much for them if they’re older or out of shape. Keep an eye out for signs of exhaustion and ensure breaks to allow for recovery. As with all new activities, check with your physician and your dog’s veterinarian before trying anything out for the first time. And have a great time getting your puppy in shape!